The lifetime of highly exposed concrete floors and industrial floors is limited. Loads caused by machines, people and negative environmental influences cause scratches, stains and holes. The concrete surface becomes rough and brittle, individual parts burst and fine dust spreads everywhere. A damaged concrete floor increases the risk of accidents and cannot be cleaned sufficiently with daily cleaning. Oil leaks, greases and chemicals penetrate into the core of the concrete and cause considerable damage. The repair or renovation of a damaged concrete floor entails considerable costs. This is not the case for the unique BECOSAN® grinding and polishing system for the improvement and protection of concrete floors. With BECOSAN® you will transform your old and dusty existing concrete floor into an extremely hard, dust proof, durable and abrasion resistant surface. BECOSAN® consists of two powerful components. On the one hand BECOSAN® Densifier, on the other BECOSAN® Protective Sealer. The densifier penetrates deep into the core of the concrete and hardens and compacts it due to a molecular reaction. It creates a very hard and extremely abrasion resistant surface. Unlike superficial concrete coatings, BECOSAN® penetrates deep into the core of the concrete and chemically bonds the free lime particles to a considerably more resistant surface. This offers ideal conditions for daily traffic of heavy vehicles and people. The patented BECOSAN® system has been designed for grinding and polishing industrial concrete floors. BECOSAN® can be used wherever an improvement and renovation of a concrete floor is necessary. 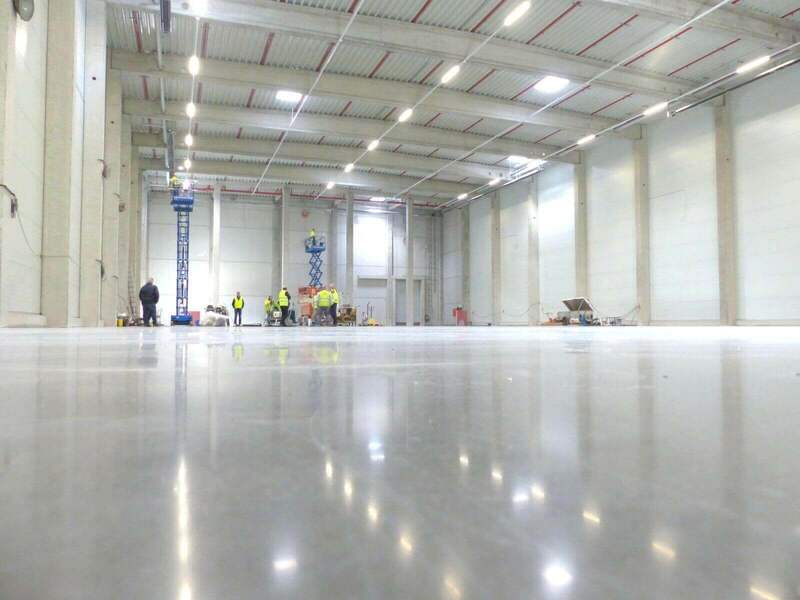 Factories, workshops, production halls, cellars, car parks, industrial buildings, sports stadiums, hospitals, airports and railway stations are ideal areas of application as these concrete surfaces are subject to severe stress. BECOSAN® is a sensible and value-enhancing investment! It is low in odor, colorless, environmentally friendly, solvent free and very easy to use. BECOSAN® is a complete system for rough and dusty concrete floors. Our clients are private construction companies, architects, entrepreneurs and municipal authorities. They all appreciate the quality of BECOSAN®, the high-performance protection for concrete floors. The powerful BECOSAN® Protective Sealer is based on the last microFORMULA® nanotechnology. It consists of finest molecules, which penetrate deep into the concrete pores. Regular cleaning is easier and faster, while the polished floor always looks clean and dust free. BECOSAN® is the ideal solution for highly frequented industrial floors in factories and production facilities. Treated floors will be resistant to scratches, impact and dirt. BECOSAN® Protective Sealer is UV-stable and does not alter the color of the floor. The combination of BECOSAN® Densifier and BECOSAN® Protective Sealer turns rough, dusty and unattractive concrete floors into a smooth, dust-free, hard and abrasion resistant surface. The result meets the highest requirements. You will be very satisfied as BECOSAN® Densifier creates a surface resistant to scratches, dust and stains. On the one hand, BECOSAN® Protective Sealer protects your floor against oils, greases or aggressive chemicals, reducing cleaning and maintenance costs to a minimum; on the other hand, it extends the life span of your floor. Already after a few years your investment will be paid off. Without a doubt, polished concrete, also known as troweled concrete, has been an important approach for the construction of large surfaces for years. Its low cost, speed of installation and high durability are its main attraction when what we are looking for is a functional floor that can be operational very quickly. 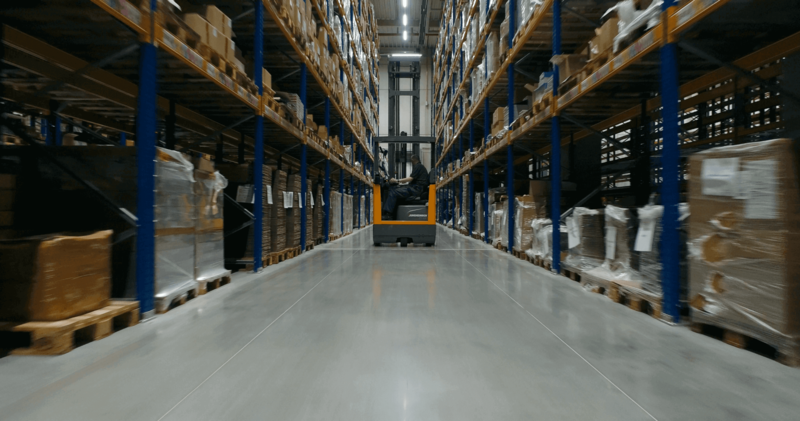 These surfaces are very durable and, therefore, a high percentage of large brands have polished concrete floors in their facilities, in logistics centers, in stores, in shopping centers, etc. Many of these companies are very experienced and know that the maintenance costs of floors in their facilities can be very high. They also know that this is crucial in maintaining their competitiveness in the market so they spend time carefully studying where these expenses come from and how to minimize them. At BECOSAN® we know that each floor and each pupose are unique, that’s why we like to give detailed and personalized information to guarantee the best quality to each client, do not hesitate to contact us, tell us your particular case to find out if BECOSAN® is for you and how can you improve your concrete floor. Why treat your concrete floor with BECOSAN®? With the passage of time the concrete floor deteriorates creating a fine and uncomfortable layer of dust. In addition any product or fat penetrates and remains on the surface as a stain. At BECOSAN we know how important it is to maintain the quality of an industrial zone and what that means. That’s why our system is especially focused on those industries that seek the maximum quality in their facilities. We are one of the systems for polished concrete surfaces with more certifications and quality standards than any other specialist in the market. Our floors are guaranteed for 10 years! ISO 9001: 2008 Quality standard. DIN 52108 – Resistance to abrasion. DIN 52617 – Water absorption. CE – Declaration of performance. Learn more about the certifications and standards of BECOSAN® finished flooring. From BECOSAN® we have an international presence and large logistics companies have chosen us for our reliability and quality. Our concrete floors have been hardened and sealed so that dust particles are not generated in the concrete. Our polished floor now has increased its resistance to the passage of heavy machinery, to the daily transfer of products with improved life and efficiency. Now it is much easier to clean and maintain the flooring with minimal resources. How to know if BECOSAN® is for you? Do you already have a concrete floor and are you planning to treat it or change it? Are you going to install a floor and do not know what type of flooring to choose? Our professionals handle almost any type of work, be it restoration of worn concrete, installation of a new floor or removal of an epoxy coating. Once you have a concrete surface, the soil is ready to be treated. 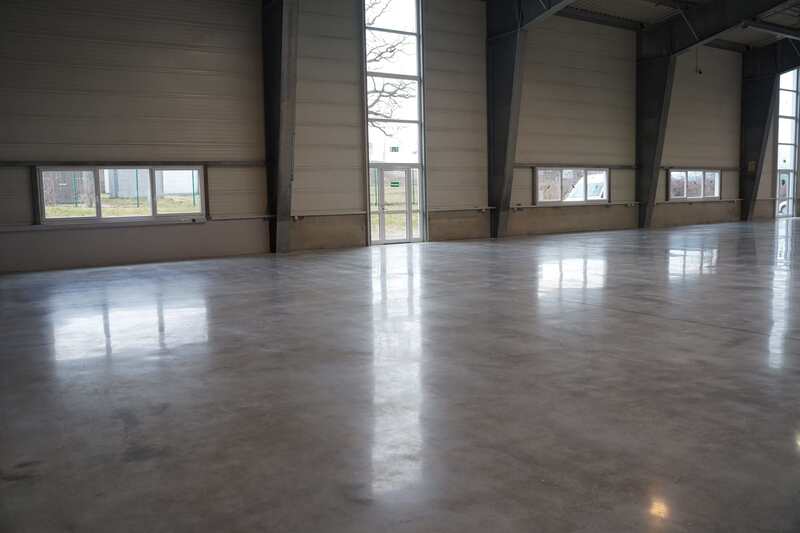 The finish provided by our polishing of concrete and ease of application make polished concrete a good choice for all types of facilities and uses: offices, dealerships, workshops, warehouses, factories, car parks, shopping centers, logistics centers, markets, etc. What is the BECOSAN® system? The BECOSAN treatment is specially designed for concrete floors and combines a floor polishing process with specially designed diamond discs and a two phase surface treatment process. Firstly, we apply the BECOSAN® Densifier which is a concrete hardener that penetrates deep into the surface of the concrete and compacts it through a molecular reaction. With this process a hard and resistant concrete floor is created. Secondly we apply the BECOSAN® Protective Sealer. This a sealer for concrete that protects the surface against the penetration of water, oil, grease and other chemical products. Unlike epoxy resins, or any paint for polished concrete floors. The concrete hardener is an alkaline solution that combines with the free lime on the surface and penetrates the concrete floor, increasing its strength. In the following link you will find more about this additive which hardens and seals the concrete. How do we combine these with a polished concrete treatment? How do you get a beautiful shine on the concrete? With a process of troweling or polishing of concrete, different gloss finishes are achieved, each client has a unique requirement and we adapt to whatever the situation requires. Here we will show you our finishes and the processes we use to achieve them. There are three main types of finishing depending on the number of polishing passes and the roughness of the discs utilised. 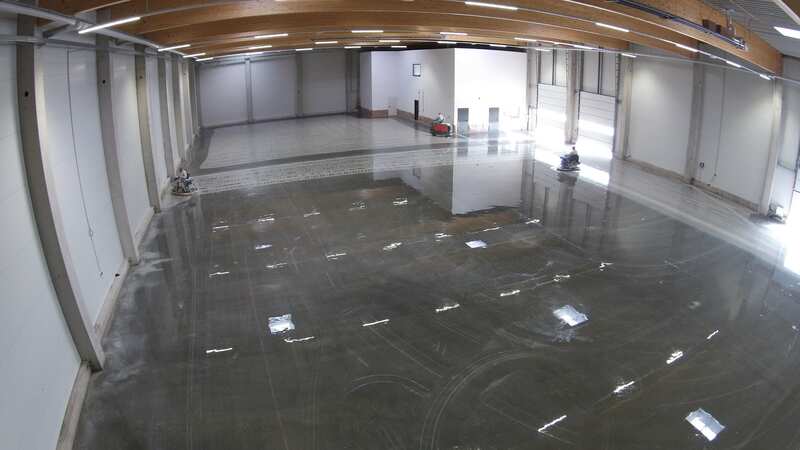 All these processes are of a general nature, our polished concrete applicators will perform a detailed evaluation each floor to adapt the polishing process to the exact needs of the client. In some cases it is necessary to rough the surface prior to the treatment. Visit our post on how to polish concrete floors and its different finishes for more detailed information. From BECOSAN® we treat each project independently because each installation is uniquely individual. The price per square meter of concrete varies depending on the state of the existing floor, the quality of the concrete laid and the overall size. To consult prices, contact us for a commitment free quotation.